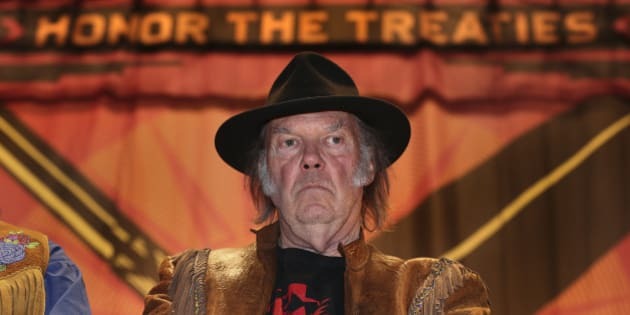 Neil Young has some strong words for Canada's political leadership — specifically, the damage it has done to the country's environment and reputation. Hours before his Vancouver concert on Monday, the expatriate musician told reporters he's become so "disillusioned" with Canada's political system he wouldn't vote, even if he could, according to Vancouver weekly The Georgia Straight. Young said Canada's "backwards" political leadership has "trashed" the country's resources and diminished our international image, according to The Globe and Mail. “I’m not happy about Canada’s endless search for a drop of oil; I am not happy about the backwards leadership that is looking over its shoulder at what used to be and trying to make it happen again," he said. Young, who has previously spoken out against the oil sands, appeared with David Suzuki to announce he was making a $100,000 donation to the Blue Dot movement, a campaign pressuring the government to recognize environmental rights. He said the bulk of the donation would be coming from the proceeds of his concert that evening. "This leadership is ... just backwards," Young said, according to CTV Vancouver. The goal of the Blue Dot movement is to have the right to a healthy environment enshrined in the Charter of Rights and Freedoms, according to its website. Suzuki expressed disappointment with the way federal leaders have been separating environmental issues from economic ones throughout the campaign. "Everyone acts as if the environment is somehow the Green Party’s specialty, so we act as if its somehow separate from economics—and since Elizabeth May wasn’t at the debate about the economy, well, we don’t have to talk about the environment," he said. Young said the while he didn't want to turn the Blue Dot movement into a "political contest," he said that he "strongly" believes in it. "I think Canada should have this and show some leadership in a good direction, instead of what we’ve been experiencing,” he said.